Our Process - Wealth Legacy Group®, Inc. The Wealth Legacy Assessment™ provides an unbiased review of how well your current planning serves you today and how well it will hold up in the years to come. Does your planning reflect your intentions??? The Wealth Legacy Assessment™ is a ‘quick check-up’ that evaluates up to twelve critically important areas of planning. The assessment measures how well your current planning aligns with your personal goals. Based on the findings, Wealth Legacy Group, Inc. founder, R.J. Kelly, will provide up to (5) five observations and recommendations to improve your position for each of the areas assessed. Don’t unintentionally hurt your family, leave wealth that is unprotected or a legacy that is unfulfilled. 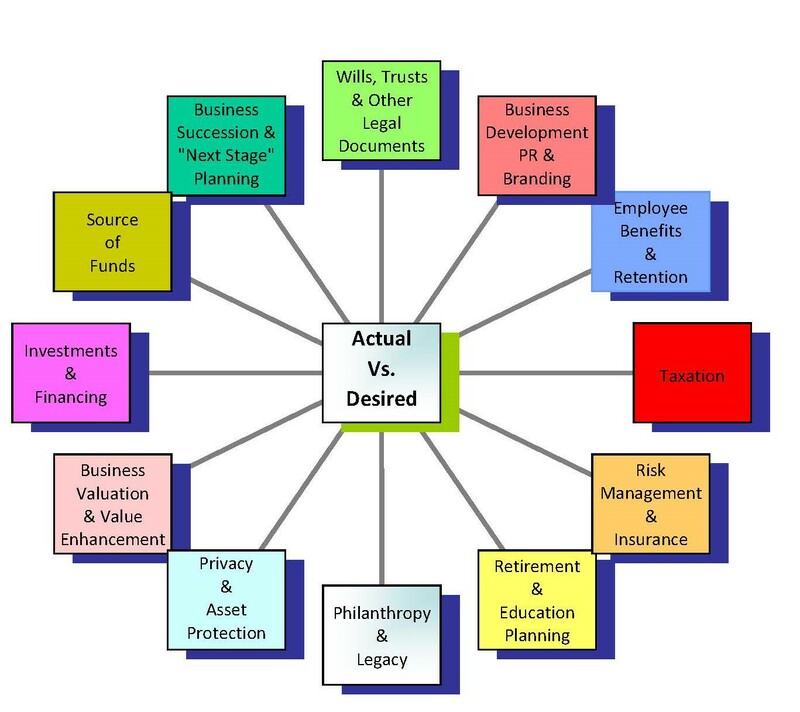 Measure your “actual versus desired” … take the Wealth Legacy Assessment™ today! Core Assessment – A core assessment looks at the four areas most frequently of concern and interest to our clients: Estate Planning, Risk Management & Reduction, Retirement, and Investments & Financing. Comprehensive Assessment – A comprehensive assessment includes additional areas such as Business Succession & Transition, Enterprise Value Creation & Enhancement, Employee Benefits, Taxation, Philanthropy & Legacy, and Asset Protection. Critical Action Roadmap™ – This is a core assessment without the full written presentation. By streamlining our reporting, we are able to offer our robust recommendations and expertise in a more cost effective format. Personalized Assessments – Let us customize an assessment to meet your most pressing needs. Focus on those areas of focus that are most important to you. Business Transition and “Next Stage” Planning – If you are a business owner, have you developed a business transition plan? Business exit is inevitable. Don’t let it take you by surprise. Wealth Legacy Group can assist you in the development of a comprehensive plan.